Two scientists in North Carolina recently conducted a study into the impact of eating bananas and pears before and during exercising as opposed to just drinking water. They found that the fruits can have a positive impact on both performance and recovery. In the study “Metabolomics-Based Analysis of Banana and Pear Ingestion on Exercise Performance and Recovery” published in the Journal of Proteome Research, the scientists David Nieman, DrPH and Nick Gillit, PhD, found performance times of the cyclists studied were 5 percent and just over 3 percent faster when banana and pears, respectively, were consumed versus water. Nieman and Gillit observed 20 male cyclists during the study. Each participant visited the Human Performance Laboratory three times, two weeks apart. After fasting overnight, they drank only water or consumed water with bananas or pears before cycling 75 kilometers at high intensity. The scientists measured metabolite shifts in the blood before and after the participants exercised and for one day of recovery. 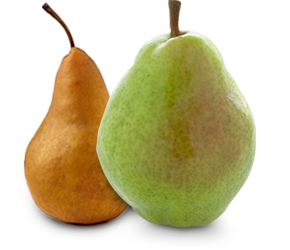 Bananas and pears differ in sugar and phenolic profiles. Bananas have a 1:1 ratio of glucose to fructose while pears have twice as much fructose as glucose. Sports drinks have a sugar profile similar to bananas, but in a 2012 study Gillit and Nieman showed that bananas are not only an effective alternative to sports drinks but also a healthier option. In addition to their favorable sugar profile, bananas also have phenolics such as dopamine that help reduce free oxygen radicals produced during high intensity exercise. Bananas enhance recovery time by reducing inflammation and improving an athlete’s ability to handle oxidative stress during cycling. Pears perform similarly and provide a healthy alternative to bananas. “The results from our studies at the Appalachian State University Human Performance Laboratory at the North Carolina Research Campus show that fruits such as bananas or pears are healthy and effective alternatives to sports drinks for athletes,” Nieman said.